Illuminated handbags which light up the inside of bags during night have been around for some time, either as actual products or as concept design. I actually wonder why this functionality has not yet reached a wider attention from manufacturer and consumers. 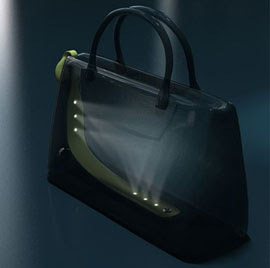 It looks to me quite practical to have a bit of light deep inside a handbag when searching for keys or other small items. Not only once I have seen ladies emptying their bags just do find what they are looking for. Maybe because light in a bag means another battery to take care off to make sure it is charged when needed. Italian designer Nicole Osella might have a solution. 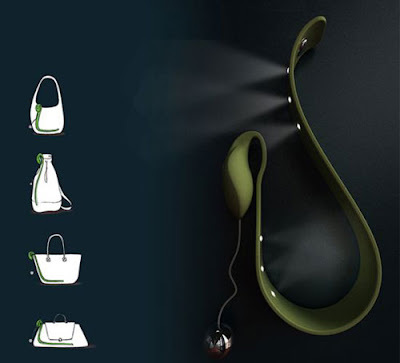 She designed the ‘Bulbo‘, an add-on module which could be used to retro fit any bag you have at your disposal and it generates it’s own electrical energy for the light. ‘Bulbo’ is a ribbon with LEDs and can be placed inside a bag. A silicon bulb on one side with a clip allows to attach the ‘Bulbo’ to any bag. This silicon bulb contains a sphere that will levitate outside the bag, harnessing kinetic energy which is stored in a battery inside the silicon bulb. Comes night the stored energy provides power to the LEDs inside the bag. Simple, smart, universal and innovative – I love such concepts.